15.09.2011 11:05 - Eurolanche fanclub has joined the discussion between blogs and websites about the Colorado Avalanche. Here is the third part of twelve. 14.09.2011 14:14 - Colorado Avalanche organization has officially started the three-day training camp for rookies. Here is the short summary from the Day 1. 14.09.2011 10:51 - Eurolanche fanclub has joined the discussion between blogs and websites about the Colorado Avalanche. Here is the second part of twelve. 13.09.2011 10:48 - Eurolanche fanclub has joined the discussion between blogs and websites about the Colorado Avalanche. Here is the first part of twelve. 13.09.2011 10:00 - The Eurolanche fanclub is also available on social networks Facebook and Twitter. Join us there! 12.09.2011 09:05 - Monday update. Former Av´s players Ruslan Salei and Karlis Skrastins together with famous Slovak star Pavol Demitra are dead + Colorado statement. 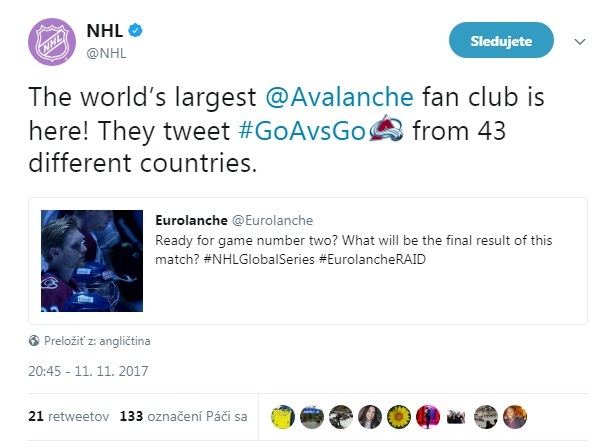 10.09.2011 21:42 - Some editors from famous US websites about the Colorado Avalanche organized an event in front of Pepsi Center in honor of Belak, Salei and Skrastins. 10.09.2011 07:17 - Avalanche signs Cumiskey to one-year deal. 09.09.2011 13:15 - Numbers of Demitra, Marek, Rachunek, Vasicek retired. 08.09.2011 10:21 - Eurolanche statement on the sad and tragic accident. Place for condolences and discussion.